While watching the building housing Vocelli Pizza burn I noticed this old sign painted to the side of the building. I asked around and found that for many years Harris Workingman’s (spelling?) Store was located here. Do any readers have more information about the store? What kind of merchandise did they sell? When did it open for business, when did it close? Who owned it? Do you have any memories or experiences related to the store that you would like to share? The building has since been torn down. New Eagle ladder truck aerial 20 - 30 minutes before collapse. 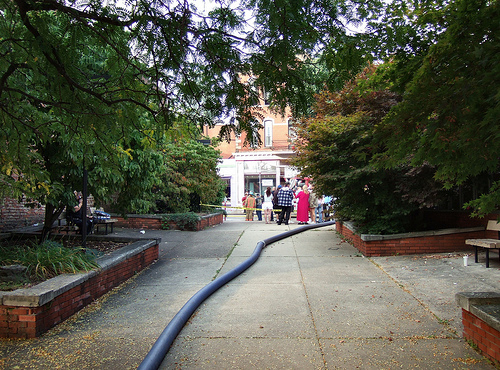 Here are links to two websites with good photographs of the ladder truck aerial after it collapsed: thewatchdesk.com and www.wusa9.com. 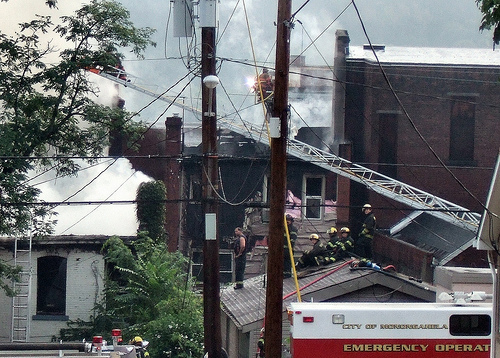 Monongahela Main St. Fire – Demolition Delayed? 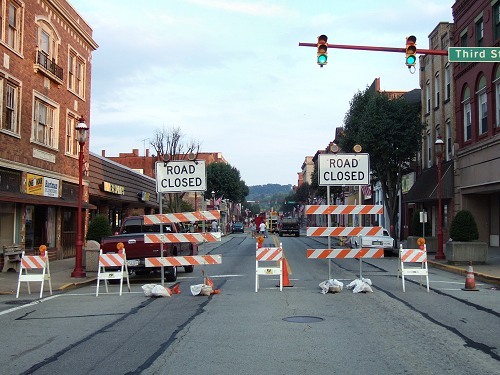 Main Street Monongahela is still closed today between 2nd and 3rd streets two days after the fire that started in Vocelli’s Pizza. 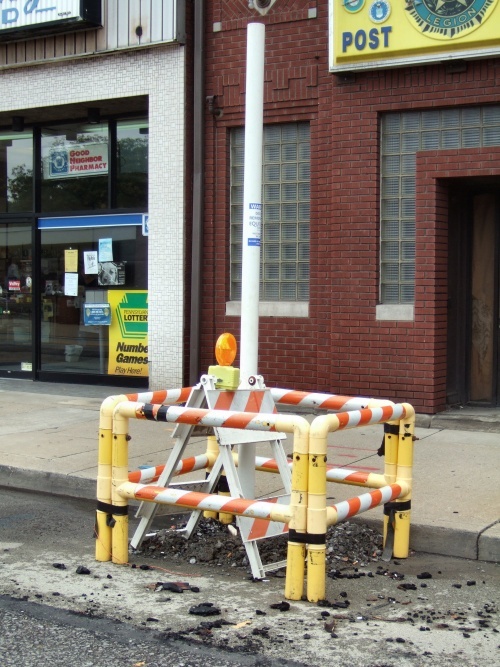 One bystander said that the driver was waiting for the road barriers to be removed. 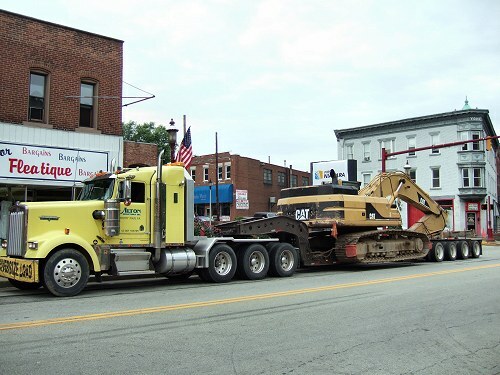 As of 2:30 p.m. today the equipment was gone and no demolition had begun. Was there some kind of miscommunication between the authorities? Rumors as to the cause of the explosion have run the gamut between a gas leak and drugs being made at the site but as mentioned above nothing has been confirmed due to the instability of the buildings. 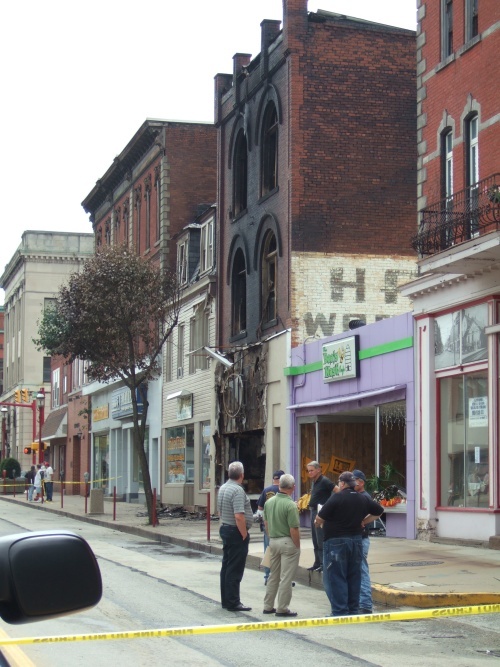 This fire started at 222 West Main Street, Monongahela Pa. (where Voccelli’s Pizza is located) around 5 a.m Sept. 6, 2009. 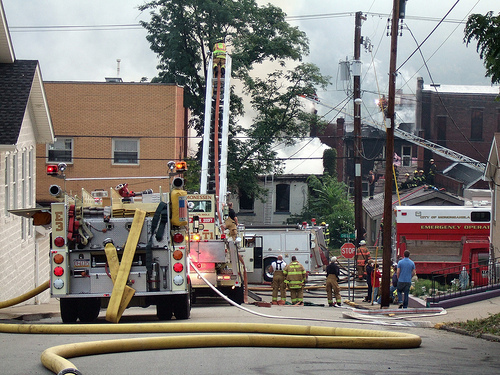 The fire spread to an adjoining building occupied by Hufnagel Computers. 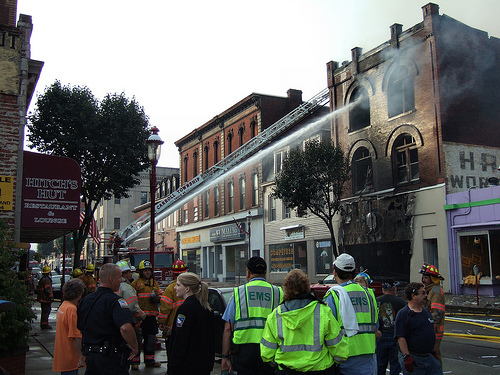 The building occupied by “The Bees Nest” sustained heavy damage when weight from water used to combat the fire caused the roof to collapse. I spoke to a man who lived on the second floor of 222 W. Main and he said that he heard two explosions before the fire started. 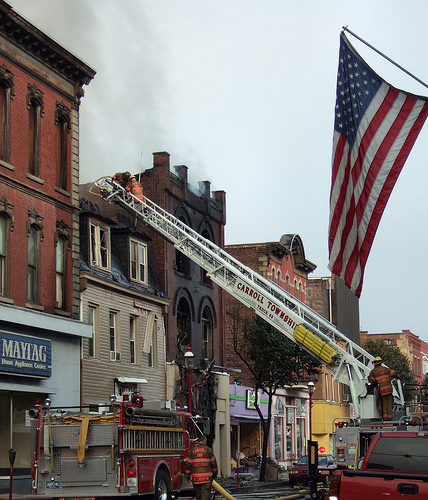 Two firefighters were also injured in the blaze. The building at 222 W. Main was one of my favorite buildings in this old part of town although it has been in poor condition for some time. Click here to see my other pictures of the fire. Elliot (on right) takes a break. 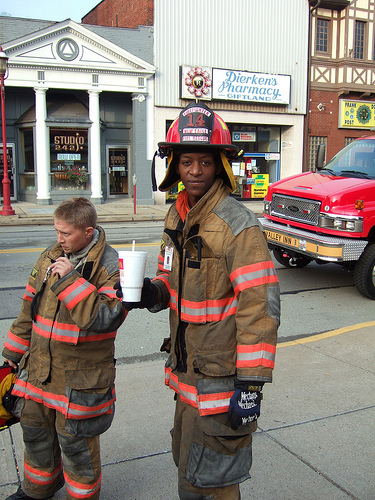 His dad was one of the people displaced by the fire. 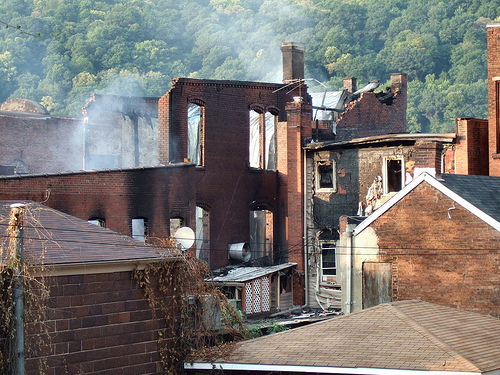 Rear view of two buildings damaged by the fire taken from Chess St. looking north. 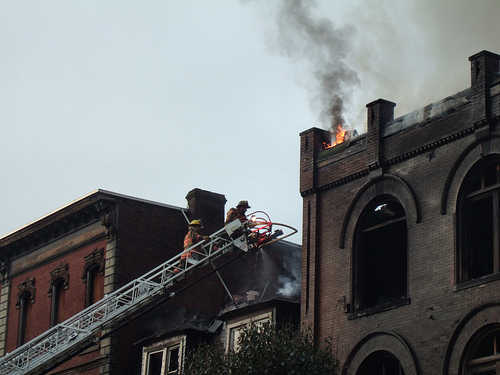 The best online article I’ve found about the fire so far is by the Pittsburgh Tribune Review click here to read more. I have other pictures taken later in the afternoon. Will post them here later tonight or tomorrow.